A space-dyed basket woven at Shaker Village. Colorful basket weaving is one of several workshops available at Shaker Village in New Gloucester this week. Sabbathday Lake Shaker Village in New Gloucester will offer a series of traditional craft workshops and educational nature walks on Saturday, August 20. Each workshop runs from 9 a.m. – 4 p.m. 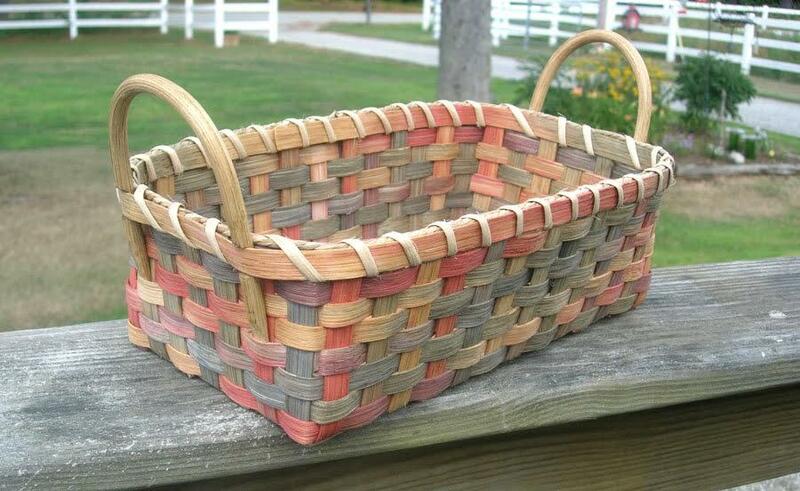 Participants can create a traditional bread basket using multi-colored (space-dyed) reed at “Space-Dyed Bread Basket making.” Local artist and basketmaker Carolyn Kemp will lead this workshop. Registration for the course, which includes a full basket-making kit, is $65. For more than 200 years, the Shakers have seated their chairs and stools with woven cloth tape – a classic Shaker feature that is colorful, comfortable and durable. Now participants can restore chairs or stools in this style with the “Shaker-Style Seat Weaving Workshop,” led by Sandy MacDonald. MacDonald will explain the history of Shaker chairs using original, historic examples along with contemporary replicas. This workshop is $50. In “Shaker Christian Cross Quilt-Top,” local expert seamstress Dianne Devonshire will lead participants in creating a 42” square quilt top replica of a Shaker-made Christian Cross quilt in the Museum’s collection. Emphasis will be placed on the tips and techniques for creating precisely matched corners, angles, and seams. The class is best suited for beginner-advanced to intermediate quilters. This workshop is $105, and all materials for the quilt top are included. Internationally renowned, local Master cabinetmaker Chris Becksvoort will teach the art of woodworking, including dovetailing and mortising, in “Shaker-Style Single Step Stool.” Participants will build a white pine single step stool with a handle, inspired from an original Shaker design. This workshop is $100. “Gentle Flow Yoga” will be offered from 10 a.m.- 11 a.m. This class, led by Sue Faunce of Gingko Leaf Yoga, is suited for beginners or those with experience that would like a more gentle, relaxing, and meditative movement at peaceful Shaker Village. The class is $10 and pre-registration is required. Resident naturalist Carolyn Fensore will lead “Nature’s Outdoor Classroom,” an educational hike through the Shakers’ 1,800 acres of diversified habitats. Fensore will identify and explain flora, fauna, geological formation and Shaker history en route. The walk will highlight evidence of glacial and geological forces that formed the land and watershed, including Sabbathday Lake’s Loon’s Point and the hidden treasure of Aurelia’s Cascade. The two and a half-hour nature walk will be offered at 10:30am and again at 2 p.m. Participants must check-in at the Museum Visitors’ Center. Shaker Village Nature Walks are free. Reservations for the nature walk are suggested but not required. Also visit the Shaker Store and the Shaker Museum Visitors’ Center featuring a wide selection of old-fashioned gifts and high-quality local Maine crafts and guided tours of Shake Village. Sabbathday Lake Shaker Village is located at 707 Shaker Road (Route 26) in New Gloucester. For more information about individual programs, including start times, reservations and registration, please contact 207-926-4597, info@maineshakers.com, www.maineshakers.com/workshops, or follow on Facebook at Sabbathday Lake Shaker Village.